The health of your practice depends on many factors, not the least of which is a happy and secure staff. When your practice has employees with high morale, they are productive, miss less work, and stay on the job longer; and all these things affect your practice’s profitability. One of the major contributors to low morale is anxiety over personal finances. How can you as a practice owner help your employees feel more secure and valued? One way is through the use of a voluntary benefits program offered by TMA Insurance Trust. Some practice owners want to offer a robust benefits package to their staff, but paying for all or part of their premiums isn't always financially feasible. Enter voluntary benefits: a group insurance plan whose premiums are fully paid by the participants. There are distinct advantages to this type of plan. • Through a voluntary group benefits package coordinated by TMA Insurance Trust, your employees may get better coverage at a lower cost than if they were to shop for it on their own. • Many voluntary benefits plans are guaranteed issue, meaning your employees can’t be turned down. This may not be the case if they were shopping for insurance individually. Having a comprehensive benefits package can help your practice attract and retain quality team members - in spite of the tight labor market - without any added cost to your business. Consider how just some these policies would contribute to the peace of mind and financial security of your staff. Dental Insurance: TMA Insurance Trust has partnered with MetLife to help provide your employees and their families with savings on dental care. Your employees can choose a dentist from over 300,000 dental locations in the MetLife network that includes nearly 80% of dental offices nationwide. The dental plan can help reduce out of pocket costs and is offered at affordable premiums and low copays for a number of preventive and restorative services, including cleanings, oral exams, crowns, bridges, and implants..
Life Insurance: According to industry statistics, more than a third of parents with minor children do not have life insurance. Most know they need it, but many are overwhelmed with all the options in the market, and lack confidence in their ability to make the right choice. Your employees may appreciate the offer of a quality voluntary life insurance program in their benefits package and finally get their family the protection they need and deserve. Disability Insurance: If they were injured and unable to work, more than 50% of U.S. employees would experience financial difficulties within a month - and almost 25% would suffer within a week. In car accidents alone, a person in Texas is injured every 2 minutes 8 seconds. What would happen to your employees if they were injured? Would they quickly suffer financial distress? A voluntary disability insurance policy could replace their lost income and provide them with much-needed security. Supplemental Hospital Insurance: Even with health insurance, out-of-pocket costs from a hospital stay can quickly add up to more than your employees can handle. A supplemental hospital insurance plan will pay cash to your employees for each day they may be hospitalized. The benefits can be used to pay coinsurance and deductibles or everyday expenses such as the mortgage, child care, or other bills. 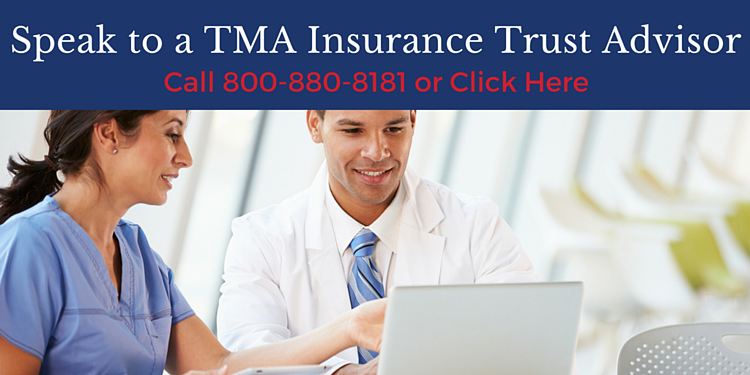 If you would like to give your staff the added security of a voluntary benefits program at no extra expense to your practice, TMA Insurance Trust is here to help. Our advisors have set up benefits plans for hundreds of medical practices across Texas. We can help you decide which benefits to offer, research the best plans, and manage the enrollment process for you. All of these services are provided at no cost to your practice, since they are part of your TMA membership. Give us a call today for a free, no obligation consultation.